GPS III satellites undergoing testing at Lockheed Martin plant in Colorado. Photo source: Lockheed Martin. A Raytheon executive said that the company expects to deliver the Block O Launch and Checkout System to the U.S. Air Force this fall as part of the GPS Next Generation Operational Control System (OCX). In addition, the company completed a baseline procedure to recertify the troubled OCX program, which was approved by the U.S. Air Force, at the end of March, said Bill Sullivan, Raytheon vice president and program manager for GPS OCX, at the recent 33rd annual Space Symposium meeting in Colorado Springs, Colorado. OCX’s development is delivered in "blocks," with Block 0 comprising the Launch and Checkout System to take GPS III satellites into early orbit. Block 1 is built on Block 0 and delivers the full OCX capability, which allows the Air Force to transition from its current GPS ground controls to the modernized and secure GPS OCX master control station. Block O was originally deployed to Schriever Air Force Base, Colorado, in 2015, Sullivan said. “It’s undergoing site acceptance testing. We’re about ready to wrap [testing] up and deliver,” he said. It has been a long road for the OCX program to get to a delivery. As Inside GNSS reported, then Secretary of the Air Force Deborah Lee James declared a critical Nunn-McCurdy breach on OCX on June 30, 2016. The breach meant that OCX would surpass, by at least 25 percent, the program’s estimated cost. The Air Force said that factors leading to the breach included inadequate systems engineering at program inception, Block 0 software with high defect rates, and Block 1 designs requiring significant rework. The breach put the OCX program on a path to automatic cancellation. To prevent the program from shutting down on that date, Secretary of Defense Ashton Carter had to certify to Congress the need for the programs and show how it was going to be brought into line. Frank Kendall, the under secretary of defense for acquisition, technology, and logistics certified the program to Congress on behalf of Carter on October 12, 2016, Inside GNSS reported. The program continues to be under scrutiny as Sullivan said he briefs the highest levels in his company as to its status. “GPS OCX has the highest visibility in the company. [Raytheon] is applying the key resources to the program,” he said. Sullivan also said the last office of the secretary of defense program review was in January. “There is one coming up in a couple of weeks here in Colorado,” he added. Sullivan said the company achieved every milestone for correcting program deficiencies last year. “That means, based on the established plan, those corrective actions put in place are working. Block O is an example,” he said. Total program cost for OCX is now estimated to be $5.46 billion. That’s up from the $5.3 billion Inside GNSS reported in April 2016. Counting all contract options, the original estimated cost for the program was $1.5 billion. About 1,000 people are working on OCX, primarily in Raytheon’s Aurora, Colorado, facility, Sullivan said. However, some of the workers are from Harris Corp., based out of New Jersey, who are working on OCX monitoring receivers in their final qualifications, he said. Sullivan said that the Air Force has authorized Raytheon to participate in a study, with Lockheed Martin, to transition from the stopgap Contingency Operations, or COps, ground control system to OCX. “After delivery [of OCX] in September 2020, the Air Force has a period of time to switch off the legacy system and turn on Block 1,” he said. The Air Force’s Critical Design Review (CDR) for the Contingency Operations (COps) contract, completed on November 17, 2016, allows Lockheed Martin to proceed with the modification of the existing Architecture Evolution Plan (AEP) Operational Control Segment. 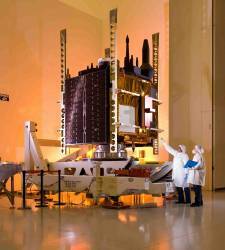 The AEP, maintained by Lockheed Martin, controls the 31 GPS IIR, IIR-M and IIF satellites in orbit. Lockheed Martin, which won a $96 million Air Force contract last year to provide COps services and supplies, said that the system’s modifications allow the AEP to support the new GPS Block III satellites by enabling them to perform their positioning, navigation and timing mission, once they are launched. In other Space Symposium news, Lockheed Martin allowed reporters to walk through the company’s secret “clean room” where the GPS III satellites are assembled and tested in Littleton, Colorado. Issues surrounding a subcontractor’s failure to test a GPS III ceramic capacitor have been resolved, said Lockheed Martin spokesman Chip Eschenfelder. As Inside GNSS reported earlier, the first GPS III satellite’s delivery, originally scheduled for August 2016, was delayed for four months because of the ceramic capacitor, provided by Harris Corp., which had not been properly qualified per the program’s approved parts control plan. GPS III Space vehicle (SV 01) has completed factory functional qualification testing and has been placed in storage since Feb. 27. SV 02 will go through space vehicle integration forecast and environmental testing in May. SV 03’s navigational payload is expected this spring. Its space vehicle integration will occur this fall. SV 04’s navigational payload is expected this fall, with space vehicle integration early next year. After other testing, the GPS III satellites go into a large chamber, owned by the Air Force, which simulates space conditions with extreme temperatures. The simulation artificially creates near and far side Earth solar temperatures. In the same building near the clean room, in the Collaborative Human Immersive Laboratory, Lockheed Martin is designing products with 3D glasses and virtual reality goggles. With goggles, technicians can “lift” a space craft’s engine parts to see where they go and other tasks in a virtual reality environment. Also at the Littleton facility, Lockheed Martin is using 3D printing to make multiple machined parts for satellites. The company said that one military satellite program reduced manufacturing parts from six months to 1.5 months with 3D printing.